Do you want to give your guest a real challenge? Try providing a game specifically designed to be a safe sport with archery tag and targets. If you visit the Wild Dunes Resort you will have the opportunity to master what few have since the days of cowboys and Indians. We have now progress from there to a safe practice range with bow and arrow and floating targets. With a patented specially design re-curve bow and arrow you can provide safe archery game for kids and adults to enjoy while they stay with you. 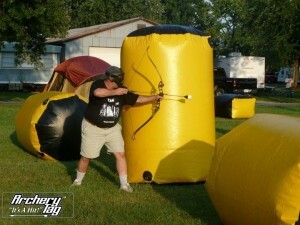 Safe Archery Tag will provide you with all the equipment you need for a safe and enjoyable experience.